What this drab little songbird lacks in flashy plumage it makes up for with its rapid, melodious, run-on warbling song. The male Warbling Vireo sings incessantly from the time it arrives in the spring to well into the summer; it will even sing from the nest. The Warbling Vireo is an uncommon summer resident found primarily in riparian woodlands in the northeastern corner and the western half of the state from mid-April to mid-September. Rangewide it is found from western Canada across most of the United States during the breeding season and migrates to northern Central America and western Mexico for the non-breeding season. Description: The Warbling Vireo has no distinctive field marks. It is grayish-green above and whitish below with a tinge of yellow on the sides. It has a dull line over the eye, a grayish line through the eye, and no wing-bars. The male and female look the same. Voice: The song is a rapid, melodious warble. Philadelphia Vireo, a regular but uncommon migrant in Tennessee, is similar in size and general appearance, but has a darker line through the eye, and distinctly yellowish underparts especially across the breast. Habitat: A variety of open deciduous forest habitats, often near water. Also in neighborhoods, urban parks, orchards, and farm fencerows. Nesting and reproduction: The Warbling Vireo is known to persistently sing until late summer, even singing from the nest. In Tennessee, nest construction begins by the end of April. Clutch Size: Usually 3 to 4 eggs. Incubation: Both adults incubate the eggs for about 12 days. Fledging: Both parents feed the young, which leave the nest in about 2 weeks and are tended by the adults for another 2 weeks. Nest: The male and female build the cup-shaped nest, which is suspended from the fork of a thin horizontal branch. The nest is constructed of bark strips, plant fibers and grasses, bound together with spider webs, and lined with finer grasses and hair. Nest heights range from 8 to 40 feet and average around 22 feet. In Tennessee, nests are placed more often in sycamore trees than other tree species. 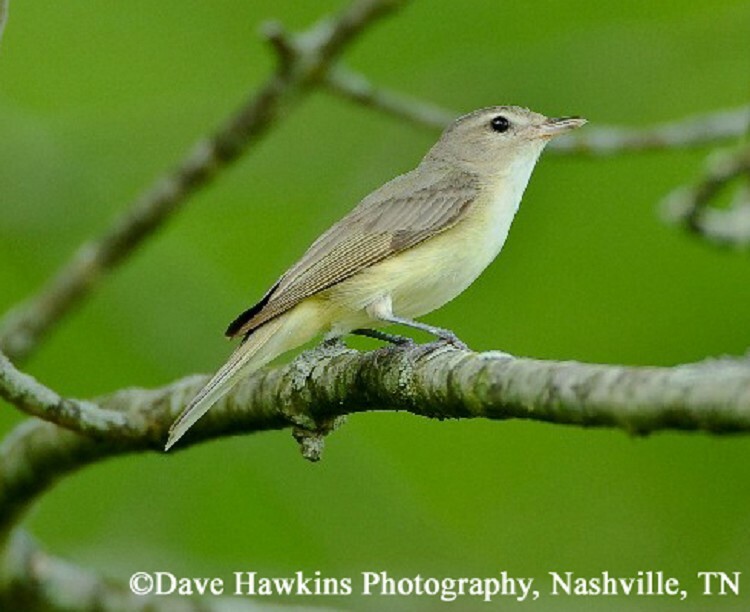 Status in Tennessee: The Warbling Vireo is an uncommon summer resident found mostly in the western half and the northeastern corner of the state. Individuals usually arrive by mid-April and depart by mid-September. It is an uncommon migrant elsewhere in the state. While Breeding Bird Survey results indicate that the Warbling Vireo may be slightly increasing in the eastern United States, it has disappeared from some East Tennessee breeding areas in the past few decades. The reason for these losses is unknown. The oldest known Warbling Vireo in the wild was 13 years 1 month old. Best places to see in Tennessee: Riparian and bottomland deciduous forest in the western half of the state, and the northeastern counties during the breeding season. Gardali, T. and G. Ballard. 2000. Warbling Vireo (Vireo gilvus ), The Birds of North America (A. Poole and F. Gill, eds.). The Academy of Natural Sciences, Philadelphia, PA, and The American Ornithologists' Union, Washington, D.C.
Nicholson, C. P. 1997. Atlas of Breeding Birds of Tennessee. Univ. of Tennessee Press, Knoxville. Robinson J. C. 1990. An Annotated Checklist of the Birds of Tennessee. Univ. of Tennessee Press, Knoxville.